The first tweet went out just before I was handed my food. 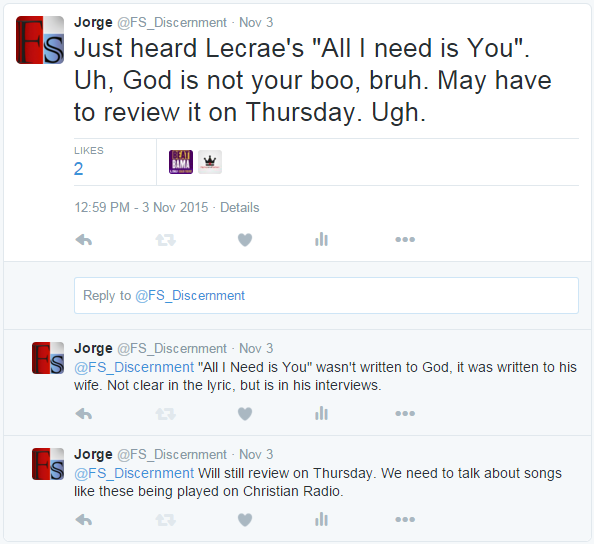 Once I got to my desk I finalized the DiM post for Tuesday and then started researching this Lecrae song to find some backstory. While this song does stay firmly in the “disapprove” category, I want to clearly state its intended context up-front. It was not properly setup by Air1 either in an intro or outro, so just hearing these lyrics in the mix of other vaguely “Christian” songs immediately tripped by “Jesus is my bearded girlfriend” brand of false-worship alarm. The lyrics themselves don’t clear it up, unfortunately, but I found an MTV interview that clarified Lecrae’s intent with the song. Not stellar, but at least it clears up the focus of the song… it’s to/for/about his wife, not God. As if on cue, Darragh enters the kitchen carrying their son, who has just been woken up from his afternoon nap. The little boy is not happy about this, aggressively rubbing his eyes and fighting consciousness. While these interviews give enough clarity for me to back down from my first tweet regarding this song, it doesn’t tip me in favor of this song being played on Christian Radio. Why? Because I struggle to find any Christian message in either of these interviews. Sure, the label “Christian” pops up here and there, but not pointing to Christ. The word “gospel” gets mentioned, but the Gospel isn’t being proclaimed. There was even mention of a cross… the one that Lecrae bears (a stigma of being a bible-thumping Christian), not the Cross of Jesus Christ. With all of this in place, let’s now look at today’s song. Look carefully then how you walk, not as unwise but as wise,making the best use of the time, because the days are evil. Therefore do not be foolish, but understand what the will of the Lord is. And do not get drunk with wine, for that is debauchery, but be filled with the Spirit, addressing one another in psalms and hymns and spiritual songs, singing and making melody to the Lord with your heart, giving thanks always and for everything to God the Father in the name of our Lord Jesus Christ, submitting to one another out of reverence for Christ. Wives, submit to your own husbands, as to the Lord. For the husband is the head of the wife even as Christ is the head of the church, his body, and is himself its Savior. Now as the church submits to Christ, so also wives should submit in everything to their husbands. Husbands, love your wives, as Christ loved the church and gave himself up for her, that he might sanctify her, having cleansed her by the washing of water with the word, so that he might present the church to himself in splendor, without spot or wrinkle or any such thing, that she might be holy and without blemish. In the same way husbands should love their wives as their own bodies. He who loves his wife loves himself. For no one ever hated his own flesh, but nourishes and cherishes it, just as Christ does the church, because we are members of his body. “Therefore a man shall leave his father and mother and hold fast to his wife, and the two shall become one flesh.” This mystery is profound, and I am saying that it refers to Christ and the church.However, let each one of you love his wife as himself, and let the wife see that she respects her husband. The Gospel of Jesus Christ is fully articulated in Paul’s teaching on the marriage relationship. So how can a Christian artist get through an entire love song to his wife without even mentioning our Lord and Savior Jesus Christ? By focusing on appealing to MTV and Billboard while “bearing the cross” of them assuming certain things about his Christianity… like that he would talk them through the Bible. Well, there’s no bible in this song. Sure, the Valley of Shadows gets a mention, but it’s okay… Lecrae only needs his wife… no one else. Never mind that when David wrote Psalm 23, the “You” is the LORD, not one of David’s wives. I find myself quite angry once again, only this time my anger is pointed more at Air1 for playing the song than for Lecrae for producing it. It’s our job to be discerning. Read through the MTV and Billboard interviews… Lecrae is aiming for secular relevance… his profession of Christianity is what he relies on to make him look unique in a sea of hip-hop. There is a need for Christian Music to preach Law to expose sin in all areas, including sexual purity, marriage, and fidelity… but CCM is seriously lacking in proclaiming the Gospel of Jesus Christ. Instead it is awash in legalism, man-made law, and mysticism and idolatry. Your marriage is a gift from God intended to point you to Him. Our sinful flesh will always strive to worship the created rather than the Creator (Romans 1). Humble yourselves in repentance, and know that Christ died to pay the penalty for our sin, so that by His Grace we are saved through Faith in Christ Jesus. When I was reading your post, I wondered over and over again, What is wrong with saying ‘you’ instead of ‘God’ in your lyrics? I’m not saying that I disagree with your points, but if we know that Lecrae is acknowledging God when he says ‘you’, how does it show that this song is not focused on God? Did you read the back story on this song at the top of the post? This song is written to his wife. I’ll try to answer that first question of “what is wrong with saying ‘you’ instead of ‘God’?” If the song lyric uses the pronoun “you” for God, I think it should be made clear. This exercise in examining lyric is just that, examining the lyric. Whenever a song with romantic tones gets played on “Christian Radio” it becomes unclear if the “you” is supposed to be God or a person. Our depiction of love toward God and His love toward us needs to stay in the Agape/Philos arena and not slip into the Eros arena. I’m not suggesting we should never use pronouns for God, I’m saying it should always be clear where our pronouns point. I would say it’s best to learn what Lecrae is doing from him in a more comprehensive format instead of soundbites from interviews. He is not just out there aiming for “secular relevance.” He’s out there to be salt and light. I’d suggest reading his new book, Unashamed. There he lays it all out and makes clear what his intent is so people can stop assuming and speculating about him “selling out” or leaving the faith. There’s nothing wrong with the man saying he needs his wife, which is a Biblical thing to say. Every song doesn’t have to use the noun God, nor does it have to have the proper name “Jesus.” Even in the Bible, there is a sexually explicit book that speaks of a love of a man for his wife (Song of Solomon), and a book in which the name of God is never mentioned (Esther). Yet these books are God-breathed just like the other 64, and you can see God all throughout them regardless. So if the Bible can give us books with meaning and purpose but that don’t have the name of God in them, the same can be said for music produced by Christians that may not directly use nouns or proper names for God. Thank you for taking the time to comment. The focus of this DiM work is examination of each song, not an examination of the artist. In this review, I shared my overreaction to the song due to it’s poor (lacking) setup on by the radio station. I looked for information concerning the song and found interview material, which was helpful. I understand the desire to justify the artist himself and the call to read his books to understand him, the man, better. This work isn’t about the person, it’s about the lyric of each song. One shouldn’t have to read an artist’s books in order to appreciate and understand the lyric of a song played on the radio. This work is also not about saying what is permissible for artists, like writing songs without naming or mentioning God. This work is about whether or not these songs being played on “Christian Radio Stations” actually proclaim the Gospel in any meaningful way. A Christian is free to pursue his/her vocation in music, that doesn’t mean that every song produced actually points others to Christ or His Gospel. And it doesn’t matter if the song i about his wife. This article is a discernment on Christian Music not the artist biography. reread this blog and you will notice there is more of a discipline on the Radio that played the sing instead of the actual artist himself. Please people, before you comment your thoughts on this blog post, make sure you’ve read through the ENTIRE post; read it word for word – don’t skim. It takes 5 minutes.